Two new exhibits open in February in the Illinois Central College art galleries, located on the East Peoria Campus. Soft Spot, a fabric art/mixed media exhibit by Noah Otten, opens February 7 in the ICC Performing Arts Center Gallery, located in the lobby of the facility. A talk by the artist is scheduled February 18 from noon to 1 pm in the gallery. In addition, Making Friends, a ceramic sculpture exhibit by Cyndi Merrill, opens February 13 in Gallery 336B, located in the Academic Building. A meet and greet event with the artist is scheduled for February 13 from noon to 2 pm, with an artist talk slated for 1:30 pm, both in the gallery. Soft Spots began with an investigation into the vast collection of fabrics left behind by Otten’s grandmother, an avid quiltmaker, after her passing in 2015. 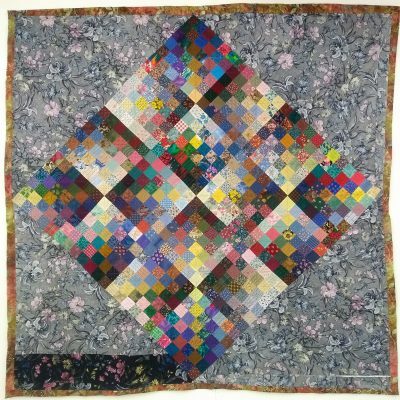 Calling upon traditional arrangements of pieced fabrics to form a multilayered hangable quilt is the artist’s major inspiration in the work. Born in and currently working from Peoria, Otten received his bachelor of fine arts degree in studio arts with a concentration in oil painting from Bradley in 2017. He recently completed a residency at the Prairie Center of the Arts in Peoria, during which time he began experimenting with sewing, quiltmaking and fabric art. The exhibit by Otten runs through March 6. The exhibit by Merrill is on display through March 8.